Discussion in 'Works-in-Progress' started by Flippi, Sep 27, 2014. You may be wondering; “What is Super Terraria World?”. Super Terraria World (STW) is a standalone (ie, non-tModLoader) massively-multiplayer online role-playing overhaul mod. The primary goal being to bring a classic MMORPG experience to the masterpiece that is Terraria. Super Terraria World encompasses a physical area far beyond the current limitations of Terraria world sizes through a new feature that connects multiple world files together. By walking to the edge of a map, jumping on a boat, or entering a doorway, you can be moved smoothly from one world to another. As STW grows, you will eventually be able to head in one direction, and through world transitions, come full circle, ending right where you started! STW brings you a different take on the Terraria you know and love. The most prominent change is that the majority of the world is static, meaning players will not be able to build or destroy tiles in most locations. There are of course some exceptions, as certain quests will ask you to place objects in specified areas, or clear out collapsed pathways, for example. However, we do not wish to to hinder anybody’s creativity and are aware the importance of building in Terraria. Eventually you will be given special plots; small, private worlds where you will be able to build, host friends and generally hang out! STW maps are designed for exploration. Even though you will not be able to dig, there will still be expansive dungeons and areas to explore. We wish to reward exploration. To that end, we are currently developing a reward system for chests. To add even more depth to exploration, we have designed a feature which allows you to enter background rooms. Ever wondered what was inside a beautiful background-only build? Well now you can find out! Simply by pressing up (or in some cases, such as elevators, pressing down), you will be moved to a new area. In addition to our changes to exploration, we have also altered how lighting works. Your characters will now emit a dim, passive source of light. This is to help exploration of unlit areas. If the passive light is not enough, you will still be able to use light sources, such as torches. However, torches will eventually burn out and vanish. Alternately, there will be some areas which will negate your passive light, forcing you to use a torch, or navigate the area blind. Take a sneak peek into some of the released regions within Super Terraria World! Keep in mind that some areas may be kept secret for the time being, and there are many other areas still in development. Characters will be able to gain experience in a variety of different skills, both combat and non-combat. Currently there are three combat skills in STW; melee, ranged, and magic. Each combat skill can be leveled up by gaining experience through killing creatures. Damaging an enemy with a melee weapon will grant you melee experience (awarded upon its defeat), and so forth. Increasing your combat skill levels will allow you to equip stronger armor and do more damage with weapons of that type. Mining: This skill dictates which ore types you are allowed to mine. Higher tiered ores will require higher mining levels. Crafting: This skill allows you to craft certain weapons, armor, accessories, and ammunition, as well as some quest items. Similarly to the mining skill, higher tiered crafting recipes will require a higher crafting skill level. Chemistry: This skill allows you to brew new potions using raw ingredients which you can find or fish from various locations. As you level up your chemistry skill, you will be granted access to the chemistry potion tree, which will allow you to pick which potion recipe you wish to learn next. Gaining levels continues to unlock points to spend in this tree. Fishing: Similar to fishing in Vanilla Terraria, though new and bigger fish will require a higher fishing level to catch. Greetings Super Terrarians, and welcome to the second patch of April 2019! Since the last release flowers have started to bloom, bunnies are hopping around, and we've been hard at work focusing on all of our packet restructuring. We're happy to say that we believe our new packets have passed our tests and are ready for the limelight of you, our beta testers! This update to our packets not only reduced our packet sizes by on average 60%, but also should help improve processing of them as well. With the improve processing of packets, we hope to see a boost in performance - please let us know your thoughts on this update in Discord! As we continue to improve the stability of the game, we are in a transition phase back to adding that juicy new content to the game. We look forward to the upcoming months! By downloading this mod you agree to the Disclaimer and Agreements above. 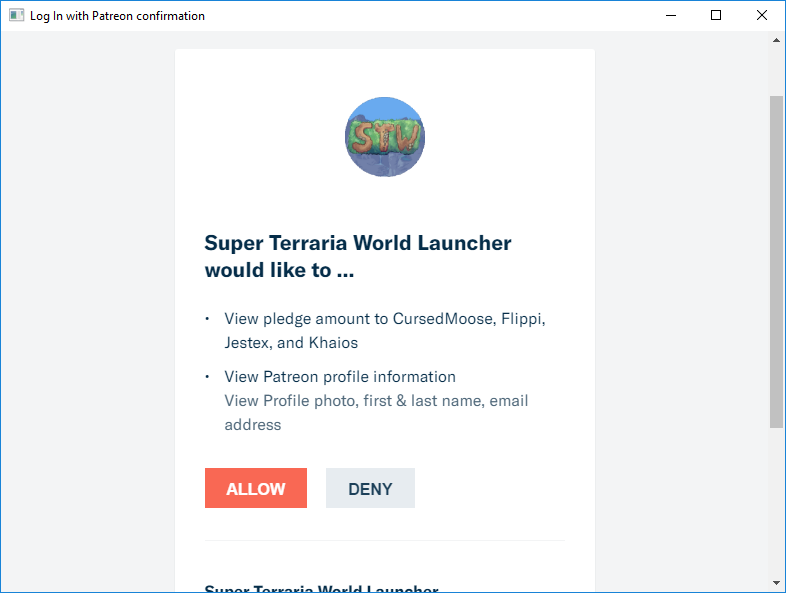 Once in the Launcher, go into "Settings"
What is a Super Terraria World? Super Terraria World is an MMORPG overhaul mod for Terraria. Its goal is to create a full MMORPG experience from Terraria with hand-crafted worlds, player progression, and exciting quests. What is an “Open Beta”? Open Beta means that anyone is welcome to download and play the mod. It is our first public multiplayer release of Super Terraria World. Wasn’t Super Terraria World already available to play? Yes and no. Super Terraria World first caught the attention of the general public during its “Single Player Alpha” stage. In order to meet the goals of the mod, the team stopped all Single Player development in favor of Multiplayer development in mid-2017. The “Closed Beta” Multiplayer version has been available to those who have pledged on Patreon since October 20th, 2018. The “Open Beta” is our first public multiplayer release. What do I need to play Super Terraria World Open Beta? You will need to own a copy of Terraria on Steam and have a PC running Windows 7 or later. We currently use Steam ID for player authentication. How long will the Open Beta last? Our goal is to keep the Open Beta accessible 24/7 until we are ready to come out of beta for a full release. Certain circumstances may affect our ability to keep the Open Beta running, primarily server stability. Under what circumstances will the Open Beta close? If our server cannot deliver a consistent, high quality experience to the majority of players, we will temporarily take the servers offline until we can confidently launch them again. We will do our best to communicate the issues we are facing and when we can expect to resolve them. Can I stream/record my playthrough? Absolutely! And please, let us know where we can check it out - we’d love to drop by and say hello. Will there be forced character resets? Unfortunately, yes. Patrons who can currently access the Closed Beta will have their stats reset prior to the Open Beta going live. During the Beta, we may need to reset player stats in response to game-breaking bugs or data loss. We also may do periodic player resets in order to gather more data about early gameplay. In those situations, we will strive to provide a new and rewarding experience for all players. Players always have the ability to reset their character at their own discretion. What happens if the server crashes? In the event of a server crash, the team will attempt to restore operations as quickly as possible. Due to the size of our team and our other commitments, server outages may last for a few hours. We thank you for being patient as we get them up and running again. Frequent crashes may lead to the need to close the Open Beta. See FAQ #6 for more information on that. What does this mean for Patrons pledging for the beta access? This mod looks awesome, how can I support you guys? Telling your friends, following us on Twitter, and chatting with us on our Discord channel are the easiest ways to support us. If you’re feeling extremely generous, you can also support us through our Patreon. What is the difference between “Open Beta” and “Full Release”? We’ve added a few commands in-game to help report bugs. All three commands will open our bug report Google Form when typed, but two of the commands will also help assist you if you’re stuck in-game. Super Terraria World is still in development, and the feature you are asking about is likely in our backlog, but make sure to drop us a line on our Discord saying what you like about that feature and why you think it should be implemented. Can I run my own server? No. Like most other MMOs, Super Terraria World runs on a dedicated server to connect hundreds of players from all over the world. There are no plans to make the server code publicly available. Drop by our Discord Server and come chat with us any time. SkeletalDestroyr, Melly the WM, Kojiro_S and 86 others like this. PIXEL [Goldman], DontEatSocks, Grand Paladin Tyrux and 4 others like this. This seems really ambitious, but I can see it happening. Good luck! The summoner class currently is part of the mage class. As the game stands, I don't think the summoner items are enough to make it a full skill. Perhaps after the mod is released I can look into adding new items for the summoner class. Thank you! I've got a lot of the core features already implemented. I hope to start alpha testing within the upcoming weeks! One of the biggest issues I am having is actually finding someone to help me make the static world. I cannot code and work on the map at the same time, plus I am not as artsy and good as many other players. I'd love to recruit someone. So if anyone is willing to just let me know! Happy to hear that! I'm reaching out to the community now for some help with making the first map. Once that happens, the alpha testing will start! Some need a pro map maker? I'm your guy. Give me some starting stats you need, and I'll get it built. For the multiple maps, how many and full layout would be useful as well. We can discuss that more here too. I've actually started the first map, would love to have some help finishing it off for the alpha test. I imagine three maps in total right now ( for beta+ release), but because of the my new code the worlds can be infinitely tied together. I've also already written up a document that explains the first world. Send me a PM of your steam ID maybe and we can chat about it easier, and I'll be able to share with you what I've got so far. I look forward to this mod's development. Oh very good mod indeed! I suppose crafting different items requires levels of exp, but there are a couple thousand items, how would you add exp for them all? By category? Can't wait. I don't think there's too many leveling mods that level up certain stats based on use of those stats. Me too! I'll be making a new weekly update post in reddit soon! (should be today or tomorrow). Crafting items are based on their base item. For example a lead pickaxe needs lead bars and wood to make. If you don't have a high enough crafting level you won't be able to use lead bars. If you do have a high enough level to use lead bars then each lead bar gives X amount of XP. Also, please reduce the possibility player will abuse or spam stuffs to increase skill. I will be having a closed alpha test, closed beta test, and open beta test to help with this. Is there anything that particularly comes to your mind that can be abused/spammed to increase skills? Maybe it's something I haven't thought of yet, and therefore I can address now. I of course will also be making updates post-release which will always include bug fixes, nerfs/buffs as needed, and of course new content. Well i haven't tried it yet. But if there are crafting skill. And when you convert Dirt -> Dirt Wall and Dirt Wall -> Dirt, sounds easy enough to level things up. Same thing with grinding statues. You won't be able to craft Dirt -> Dirt Wall and Dirt Wall -> Dirt because those items have no use in this mod because the world is going to be static. Likewise with furniture and other building materials. All of the craftable items are in that document ( accessories to be added later ). This would work only on small servers however because the landscape will be stripped of everything. I love the idea for small servers and I might even use it sometimes, support! Love the idea it would be a great server mod especially for small pvp servers. It helps keep the adventure in the game without all the hidden chest giving everyone terra blades like some servers. That actually won't be the case with the mod. There is a "cave-in" feature which fills in caves with ore and dirt so you don't run out! I will be including pvp in a future release, but there are no plans to have complete support of pvp in the original release.